With the XML sitemap extension, you can easily generate a custom XML sitemap for Magento 2. No need to add your enhanced sitemap file manually as the module creates it at a specified frequency. Creating a XML sitemap, you help search engines crawlers learn more about the website structure and decrease the possibility that they will overlook some pages. Properly instruct the web spiders and speed up indexing your website content. Help your store content to be indexed quickly. Easily configure Magento 2 XML sitemap. Set frequency of updates for each group of links. Specify priority of importance for a link type. Set separate parameters for Home page. Decide what additional links to include. Exclude out of stock products. Add categories images and products videos. Make general and individual settings for each content type. Define the size limits of a sitemap file. Indicate the maximum number of URLs. Schedule an XML sitemap update. Have an extensive website structure with multiple products and categories? If you want to optimize it for search engines, one of the useful things is to generate an XML sitemap. It is a file containing links to all pages of a website. Search engines read it so that properly crawl and index your website. But you can’t create a sitemap in a flexible way using sitemap generator or standard Magento functionality. With our Magento 2 XML sitemap extension, you can select content to be presented in your XML file. On a product and category page settings it’s possible to exclude a certain item or make individual parameters for adding it to the sitemap. So, if you get new pages you can specify higher priority for them so that to be indexed faster. Moreover, you can optimize the homepage by adding the prime priority to it. As well, include categories pictures and products videos to bring more traffic to the web store. Hide products that are out of stock or include additional links that are important to better search engine exposure. By the way, submitting your sitemap to the Robots.txt file will make search engines find it automatically. If you put all your web store content in the right way, search engine crawlers will better understand the site structure and might not overlook important pages. So, any new item can’t be ignored. Use extended functionality to generate a sitemap hands down. Now you can include and exclude any product, category and CMS page from the list as well as make advanced individual settings for them. With Magento 2 XML sitemap you decide what links to include and what pages hide from internet bots. So, you define importance of a certain category, product, CMS page as well as other additional links. There are detailed settings for each link group. You can set the common priority and frequency for a content type. Or specify the values individually for products, categories, home and other CMS pages. For SEO purposes, you may want to include some links to your sitemaps. You can enter the URL, set frequency and priority to it. All added links are placed on the grid to be easily managed later. It’s not necessary to delete extra links as you can simply disable them. Hide irrelevant products to increase the visibility of others to web crawlers that index your site. If out of stock items are going to be replenished in the short run, there is no harm to keep them in the sitemap, and their position is to be preserved. Including images and videos in the sitemap may bring you more traffic when search engines index them. You give bots more information about your site media content and subsequently boost your SEO. This can give you a few more visitors if your images and videos are shown in search results. 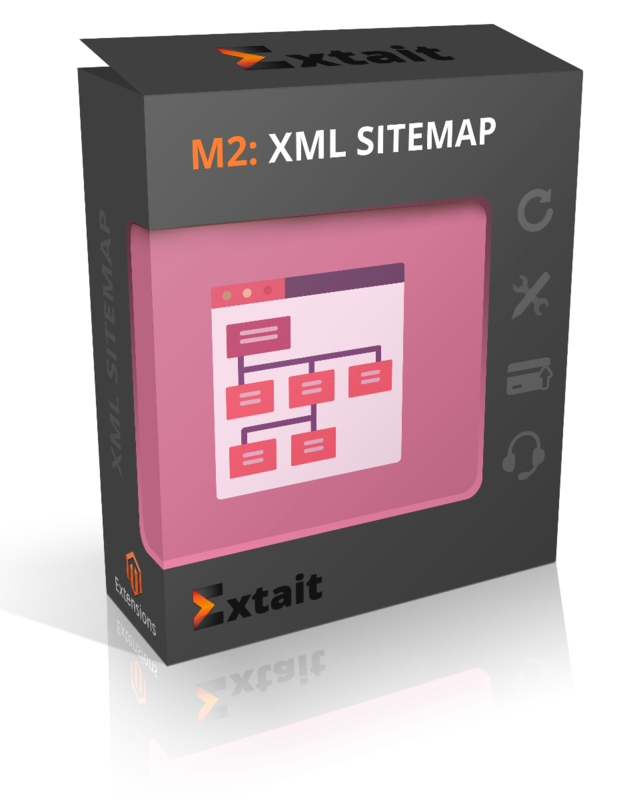 As soon as you carry out all configurations, you generate an XML sitemap in one click. Moreover, you can schedule sitemap update. Specify the start time and frequency of the generation. So, when some changes are made, later they are added to an upgraded file.